“Asians like to plan everything, we Americans tend to plan the first stop and swing it from there,” remarked our tour guide at Stag’s Leap Wine Cellars. Respectfully, he obviously did not understand the pain of flying a good 16+ hours, and the amount of determination required for an average white-collar from Asia to allocate literally his/her entire annual leave for the whole year just to make this wine trip happen. (On average, Asians have around 10 days annual leave.) You will want to plan. You will naturally want to use every minute of your trip well.I put on my planner hat when asked to join a Napa and Sonoma wine trip with friends from Hong Kong couple weeks ago. 96 hours for a Sideways experience sans midlife crisis resolution. This is my version of a 4D3N Napa and Sonoma trip, in dedication to my wine buddies in Hong Kong and all others who simply do not have the luxury of spending weeks in a wine country but still want to see it all. Our Day One and Two were spent entirely in Napa Valley. It is indeed very tempting for first-timers to focus their energies on famous valley floor sites along Highway 29, but that would have allowed us to mainly see the historic part (and generally more touristy side) of Napa. Instead, we drove up and down the hills of Napa Valley, focusing mainly on exploring the less-travelled mountain and hillside sites and wineries. I chose to start my trip in Sacramento instead of San Francisco. 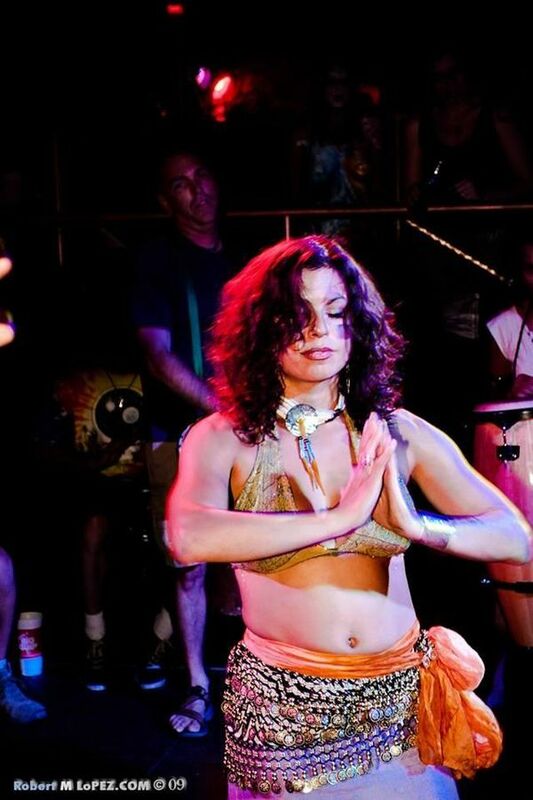 Both cities are great starting points, each approximately 50 miles from the heart of Napa. We travelled with Southwest Airlines and flying to Sacramento (from either Los Angeles or Las Vegas) allowed us all to get in early in the morning before 8am instead of around noontime for San Francisco, enough said. We met up at the airport around 8am and hustled to the car rental centre, a short 5-minute shuttle ride from the airport. These two rows of vines belong to two different blocks in Chappellet, the one on the left marks the beginning of a remarkably steeper slope which forms the hillside block, whereas that on the right belongs to the hilltop block. Such detailed differentiation is practiced in Chappellet in order to enable meticulous quality sorting. 1. To see the AVA-quality level non-AVA site Pritchard Hill which, according to Donn, Chappellet’s founder, it is “a hole between Oakville, Howell Mountain, the Stags Leap District, Rutherford and Chiles Valley”. 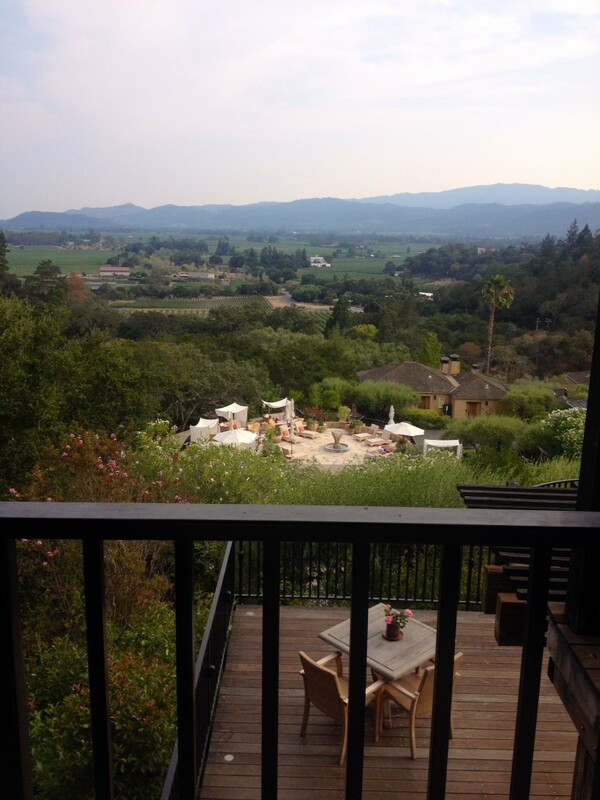 On Pritchard Hill, you would be able to see the two mountain ranges that define Napa Valley in one panoramic view. 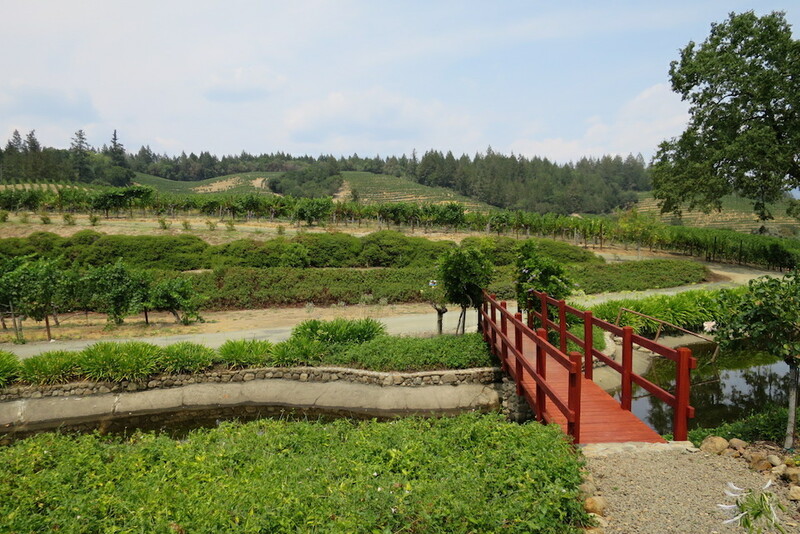 Facing the hilltop of Chappellet, on your left you will see the luxurious, plush and green Mayacamas, on your right you will have the sparsely vegetated, sandy Vaca Mountains. 2. Chappellet is one of the pioneers of hillside vineyard planting in Napa back in 1960s. In fact, they have gone into differentiating hilltop versus hillside blocks these days. 3. Chappellet bred a handful of renowned winemakers, all of whom have significantly shaped Napa wines till now: Philip Togni who brought the essence of the legendary Emile Peynaud “Father of Modern Winemaking” to Napa and now produces from Spring Mountain AVA, Cathy Corison who found her way back down to the valley floor in St Helena AVA, and Tony Soter who moved away from Napa in 2007 and settled down in Yamhill-Carlton AVA in Willamette Valley, Oregon. 4. Trivia: The sacred-looking pyramid-shaped main building that houses Chappellet’s visitor centre and part of their winery is the preferred chapel for a handful of Master Sommeliers and the loves of their lives. What do you get out of the visit? It takes no more than 30 minutes to get from Pritchard Hill to the town of St Helena. August being the peak season for Napa wine tourism, you should expect a fairly difficult time to find a parking spot on St Helena’s Main Street. This small town is surrounded by great eateries like Greystone Restaurant, which is housed within the Napa campus building of Culinary Institute of America (Note: the restaurant is closed over specific periods of times throughout the year, always check their website to make sure they are open! ), Tra Vigne, Archetype etc. However, when you only have 4D3N, plus wineries are usually open only from 10 in the morning till 4 in the afternoon, you probably do not want to slot in long lunches. We headed over to The Model Bakery for a simple sandwich, some pastries and sizeable 16-ounce coffees. Simple, country style bakery. Not bad as a noontime vino break destination. The three original single vineyards defined by Al Brounstein, founder of Diamond Creek Vineyards are Red Rock Terrace, Gravelly Meadow and Volcanic Hill. They are very close to each other but each enjoys a distinctive soil profile and mesoclimate. Getting to the pond at the bottom of Red Rock Terrace places you at a point where you are 60 feet away from each single vineyard. A short 10 minute drive or a relaxing 30 minute hike would take you to the Lake Vineyard, the coolest and smallest single vineyard of the estate. 1. Diamond Creek started applying Burgundy’s vineyard classification in Napa. Acreage of each of their distinctive blocks are comparable to the sizes of some Grand Cru sites in Burgundy! The smallest being Lake, which only claimed 3/4 acre, and the largest is Volcanic Hill which took up 8 acres. 2. Diamond Creek was the first Napa Valley winery to crack the $100/bottle mark at retail, in 1987. That wine was the 1978 vintage of Lake Vineyard. What makes the legend more legendary is the fact that when founder Al started his winery back in 1968, he brought in vine cuttings from 3 out of 4 Bordeaux first growths. Due to non-disclosure agreement, they cannot tell you which 3 they are. However, one thing for sure is that the selection does not include Chateau Mouton Rothschild for obvious reasons. Mouton Rothschild joined the Premier Cru Classe league only in 1973! 4. Trivia: I asked Phil why Diamond Creek houses more than half a dozen fountains in the whole estate. He traces it back to his father’s love for water and jokingly remarked that it might have to do with your star signs. Al is an Aquarius, Boots is likely an Aquarius too (she was born in early February) and Phil himself is Pisces. It doesn’t take a psychic to tell that this is a water-loving family. Diamond Creek Vineyards was one of the highlights of the entire trip. To start with, this winery makes it clear that they do not normally receive public visitors. The vineyard and its beautiful recreational area are open to public for just 4 days each year. My last minute email fortunately caught the eye of Phil Ross, son of Al and Boots Brounstein. Thank you Phil for receiving us at the winery, showing us around all the vineyard blocks specifically the acclaimed Lake Vineyard, and sharing a beautiful half bottle of 2006 Volcanic Hill with us. If you want to visit Diamond Creek, by all means write to them. No generic content please though. 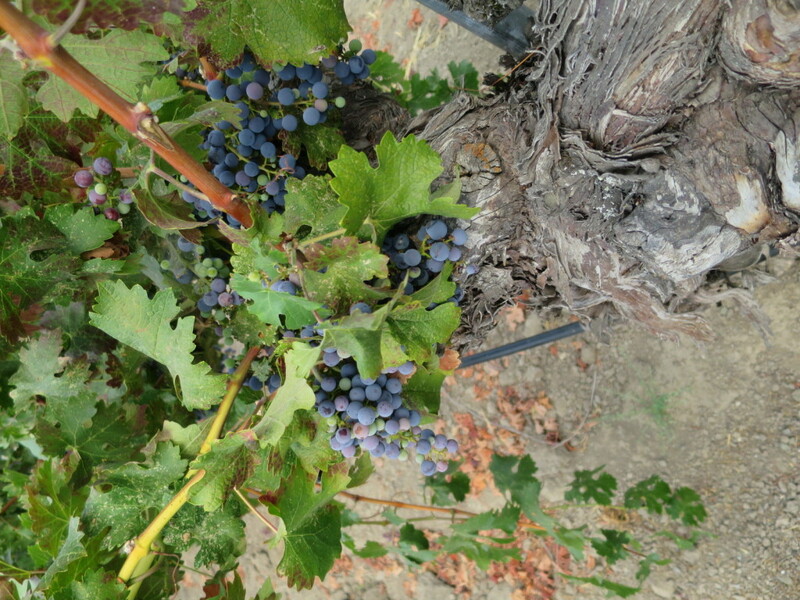 An old St George rootstock vine at Kronos Vineyard of Corison Winery. Note that the vine is head pruned. Age gives this plant a thick, gnarly, lignified trunk, reduced vigour and much spacing between berries, which encourages air flow and prevents rot within the bunch. GPS will get you there, it is just south of the town of St Helena. 1. Cathy Corison was one of the first female winemakers in Napa, she was with Chappellet for a decade before starting to make her own namesake wines in 1987, bringing her stylistic allegiance to elegant and linear wines to the valley floor, which generally gives more voluptuous, powerful wines. Up till today, Corison Winery remains known for consistently harvesting their grapes earlier than their neighbours. That among all else marks Corison’s commitment to delivering elegant wines. 2. Check out the old vines at the famed ‘Kronos’ vineyard and the vine spacing! Vine spacing is the one thing that gives the age of the vineyard away. Despite Napa’s ultra high land prices you will still see certain parcels of vineyards designated for commercial production planted relatively sparsely! 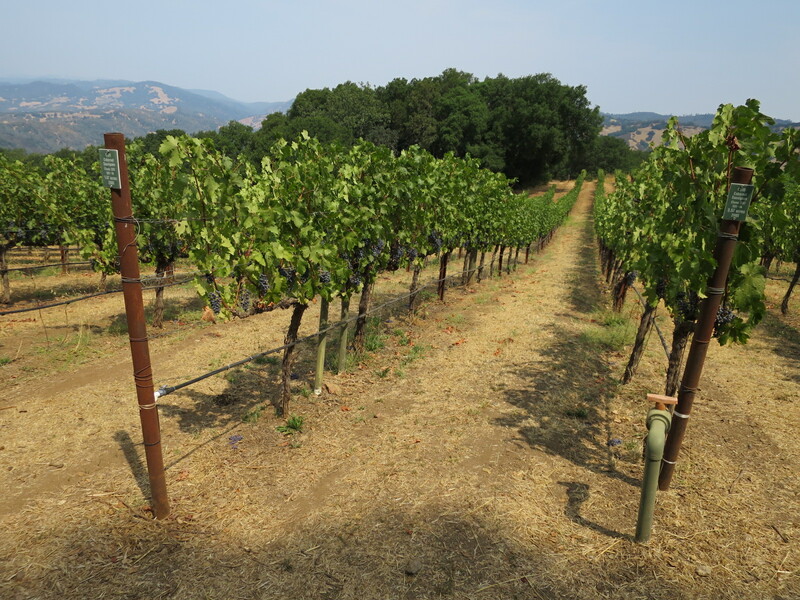 The usual spacing between rows and vines is 4″x4″, whereas for the older vineyards in Napa (boasting average vine age at 40 to 50 years old) the spacing doubles. You will see that those gnarly old vines enjoy a 8″x10″ spacing. At Diamond Creek Vineyards, Phil Ross explained the reason behind. Technology shrinks sizes of farming (and all) machines, back then they were much bigger, naturally you needed wider rows to get them through! Al fresco terrace dining at Auberge du Soleil draws a perfect full stop to our first day in Napa. GPS will get you to the entrance gate of the inn, the restaurant is just a little further up. There is no gate, and valet services is complimentary, or should I say, compulsory because self park is just not an option, maverick. 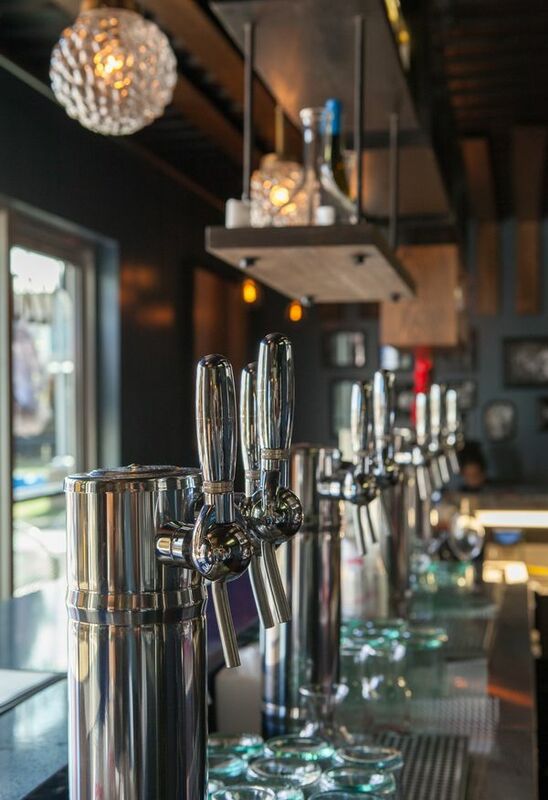 Corison tasting would take up approximately an hour, leaving you with ample time to drive over to Rutherford Hills along the picturesque Silverado Trail, which runs parallel to CA-128. Auberge du Soleil is now equally known as a prime luxury inn option and what it was originally built for 30 years ago: one of the first fine dining destination in Napa. Perched on Rutherford Hill, al fresco dining on the restaurant terrace surely ends the day with a high note, tinted in a fiery shade of sunset rouge. I was fairly surprised when they announced that tasting menu is not necessarily for the table, a practice generally adopted in fine dining outlets to sychronize service tempo. No complaint, for that makes it possible for us to try out nearly half of Auberge’s menu by doing one tasting menu and one four-course menu. After a total of 10 individual course, 5 tasting wines, a Fat Tire beer to start with and a lovely 2002 Dubrul Cote Bonneville from Washington State (well we had enough Napa for the day) to accompany the whole dinner, the soleil went down, the moon rises, the crowd is happy. 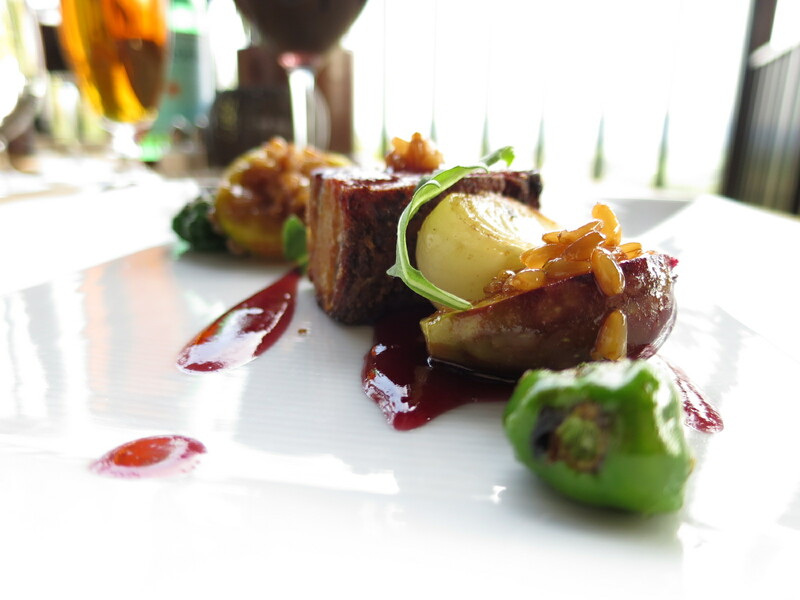 My favourite course from Auberge is their Kurobuta Pork Belly with Figs, Padron Peppers, Cipollini, Port. If you are bored of hotel breakfast, an early morning drive around the quaint downtown area of Napa well before shops open up is nice. Oxbow Public market plays host to a mix of cheese and gourmet shops, chocolate and tea emporiums, wine bars and cafes. Coffee lovers (or needers like me) might want to drop by Ritual Coffee. You will find yourself meeting three young, passionate baristas who are very keen to introducing you to their Charlie’s Coffee Factory world of aromas. I had an espresso with pineapple, caramelised banana and cinnamon flavours; and I asked if those are infused flavors, only to find my curiosity blown into smithereens by an incredulous face, followed by an almost condescending lecture on how those are natural flavors. Well, grudge aside, they make good coffees but their way of expressing their love for these brown beans simply go beyond the imagination and understanding of the “ignorant” mass. Well, ain’t it the same for wine lovers sometimes? 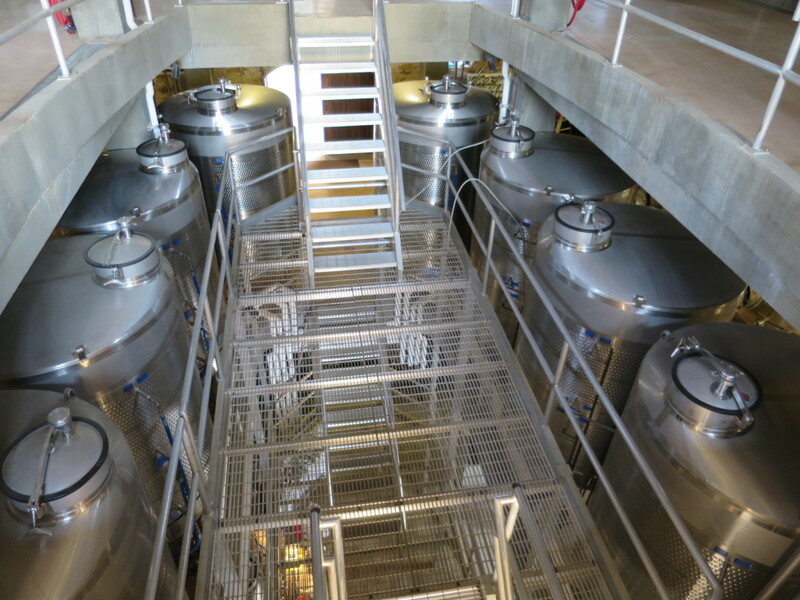 Gravity flow winemaking is one of the most impressive features of Ladera. Strategically placing their winery facilities at 3 different levels, the winery eliminates the need of crushing, as the mere force of dropping the grapes from the top level to the level below, together with the weight of grapes themselves allow crushing to happen naturally. GPS will get you close, this is how you get there. 1. Howell Mountain AVA alone is worth the trip. This mountain AVA was established in 1983 as the first sub-AVA appellation in Napa. It is also the very first AVA delineated by vineyard elevation. Vineyards within this AVA must be planted above 1,400 feet (430 metres), an altitude that elevates all of them well above the fog line. The climate here thus poses a stark contrast against the valley floor sites which enjoy cool morning fog from San Pablo Bay seeping in through Carneros AVA. Just for fun, take Old Howell Mountain Road, a narrow, winding road that guides you up this famed mountain AVA of Napa. It is a beautiful drive but most of the time you would only be able to proceed maximum at 15 miles per hour. If you are in a hurry, take the alternative, well-paved Deer Park Road. 2. Dunn Vineyard is the first name that pop up in peoples’ minds when talking about Howell Mountain. For good and bad, Dunn does not really have a hospitality programme in place. Same goes for La Jota, the other celebrated pioneer of this AVA region. Writing to both in advance (we are talking about weeks here) sincerely detailing why you want to visit, together with references from senior trade professionals may help. The alternative is to visit their neighbours which are putting their hearts and souls into making good wines. That is how I found and eventually chose to visit Ladera. 3. Superb ageability is one of the key attributes of Howell Mountain’s Cabernet Sauvignon. That usually translates into wines that are unapologetically austere and not-so-friendly during their youth. Comparatively I find Ladera Cabernet, be it their Reserve or flagship “S” selection, appear slightly more approachable than their neighbors. And the true delights of the tasting though, is their Howell Mountain Sauvignon Blanc and Pillow Road Pinot Noir (which are produced in Russian River Valley, Sonoma). Stag’s Leap Wine Cellars rose to fame in 1976 when its 1973 S.L.V. Cabernet Sauvignon beat Bordeaux first growth in a blind tasting called Judgment of Paris. 1. If you have heard about the renowned 1976 Judgment of Paris, you would have heard of Stag’s Leap Wine Cellars. Back in 1976, their 1973 Cabernet Sauvignon produced from the S.L.V. vineyard won the French versus American wine blind tasting hosted by Steven Spurrier. Yes it is the S.L.V. Cabernet, and not the flagship Cask 23, that won Stag’s Leap Wine Cellars timeless glory. Cask 23’s fame partly rooted from the fact that it was produced under the tutelage of one of the historical giants who influenced post-Prohibition American winemaking, the late Andre Tchelistcheff. Haven’t heard of him? Robert Mondavi regarded this man as his mentor. Donn Chappellet allegedly started planting grapes on Pritchard Hill following Tchelistcheff’s advice. Georges de Latour started Beaulieu’s flagship wine production because of him. The celebrated status of Stag’s Leap Wine Cellars closely links with its lengthy winemaking alumni list now permanently documented on its Wall of Fame. Whilst some wineries chose to highlight their winemaker’s decades, or lifetime, of loyalty and dedication to the winery, Stag’s Leap Wine Cellars did the otherwise. It proudly proclaims to the world that the winery’s lifeline has been shaped by over 35 different winemakers in 3 decades, and the majority upon departure has gone on to work for some of the best Napa has to offer, for example, Michael Silacci of Opus One Winery was with Stag’s Leap Wine Cellars from 1995 to 2001. 2. Stags Leap District as a region has an equally interesting story. Personally I believe in the entire history of mankind, no place has ever put such monumental emphasis on an “apostrophe”. 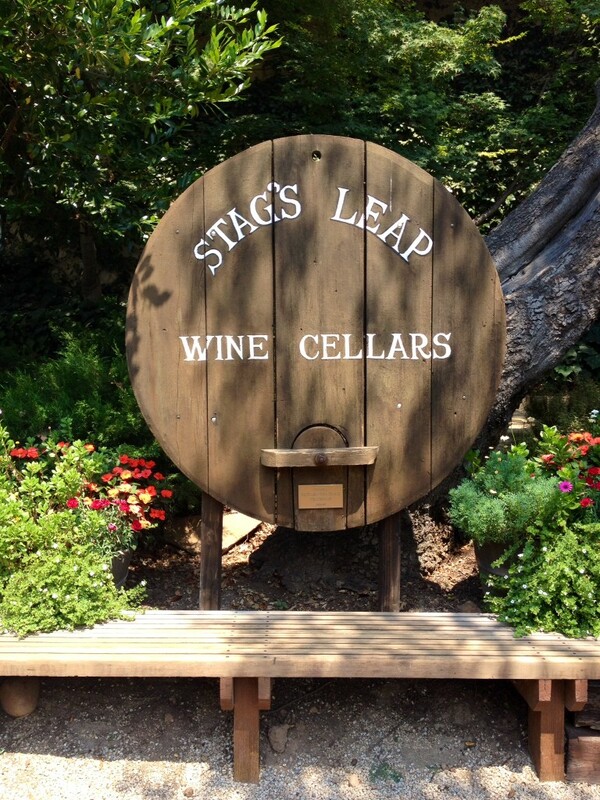 The punctuation mark has cost Stag’s Leap Wine Cellars and Stags’ Leap Winery (note the position of the apostrophe) millions of US dollars over a lengthy lawsuit on who is entitled to use “Stags Leap” in their names. California Supreme Court ruled that they should both be allowed to use it, provided that they observe the court’s decision on the position of the apostrophe! The eventual establishment of Stags Leap District as an AVA in 1989 sees the government’s witty avoidance of the million-dollar apostrophe. Just when we thought that a million dollar lawsuit is going to leave two men in lifelong rivalry, owners of the two wineries reconciled in 1986 and made an one-time cuvee called “Accord”, a blend of both wineries’ Cabernet grapes. Donald Hess, owner of Hess Winery, is one of the most prominent contemporary art collectors in America. 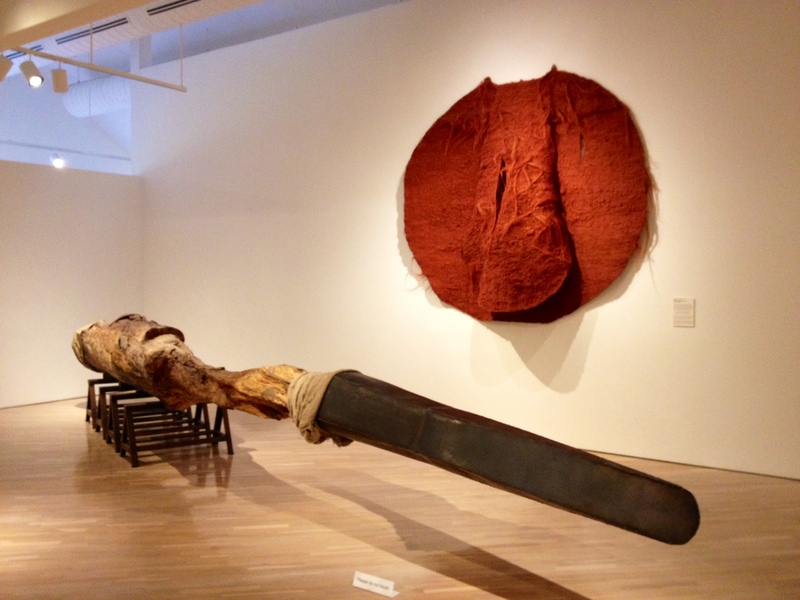 This piece by Polish female artist Magdalena Abakanowicz captured the element of war and wound, senseless destruction and regeneration into one massive piece of cannon-like art piece. 1. The history of Hess Winery is virtually an account of American wine history, from the perspective of four generations of Hess family and their predecessors. It all started with an early German settler who, against all odds, chose to settle down in Mount Veeder. Prohibition and the Great Depression in 1929 sent the winery into the hands of Christian Brothers, who expanded the winery and used the facilities to produce wines under the current neighbor of Hess Winery: Mont La Salle. In 1986 the winery was leased to Swiss entrepreneur Donald Hess for 100 years. Over the next few decades, Hess continued to buy land in Mount Veeder, building Hess Winery into the largest landowner in Mount Veeder AVA; whilst maintaining a space to showcase part of his contemporary art collection in the original winery building. 2. Historical significance aside, Hess’ visitor centre boasts an array of interesting educational tasting and tour options that go beyond the appreciation of wine. The art museum is not-to-be-missed, featuring contemporary rare artworks that generally reside in world class destinations like Guggenheim and MoMA. I myself am particularly impressed by the works of Polish female artist Magdalena Abakanowicz and Swiss photo-realist painter Franz Gertsch. Decided to immerse only in wine during your trip? Perhaps you can go for what I’d return to Hess Collection for during my next Napa trip. 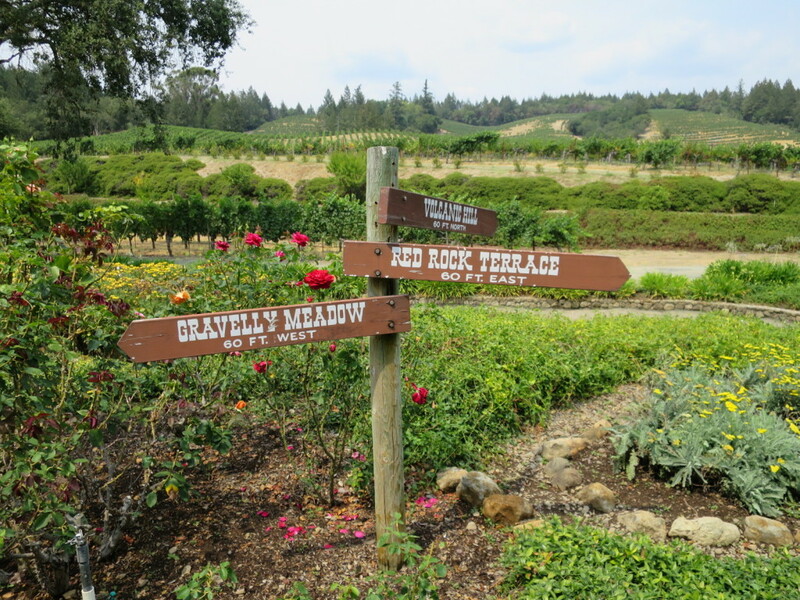 Every Thursday at 10am, Hess regularly holds a 2-hour vineyard “hike” where participants get to walk through the old Mont la Salle vineyard, the 1936 Brother Timothy old Cabernet block and the more recent blocks owned by Hess. Delicious artisan truffles developed and handcrafted with TCHO chocolate by Hess’ Pastry Chef and Chocolatier, Emma Kate Veader. 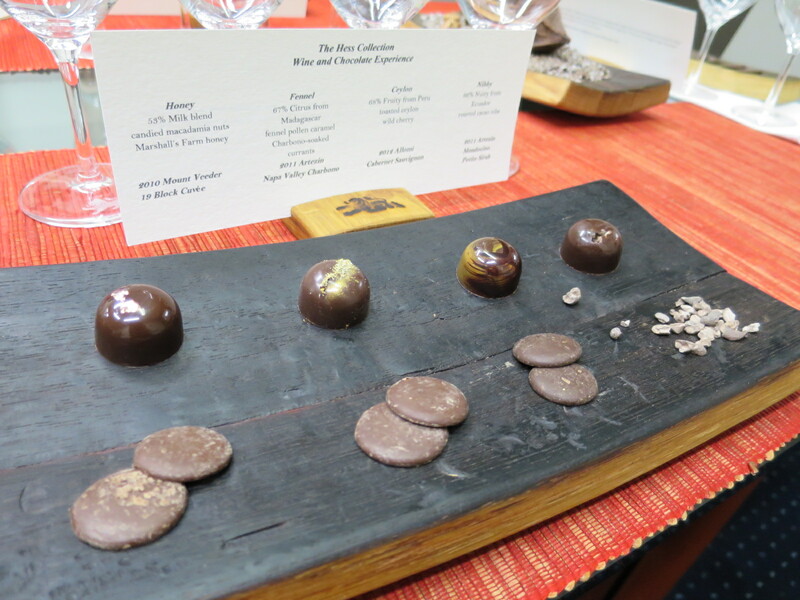 This is a serious wine and chocolate experience. Be prepared to get educated. PRESS infuses chic Californian decor elements into its modern farmhouse-styled structure. This valley floor location might not have the view of Auberge, but it charms its diners with its relaxed, warm and homely ambience. My Day Two’s choice of restaurant is more chic than classic. Instead of heading all the way back down to CA-128 as suggested by my GPS, I chose to drive along the narrow, winding Dry Creek Road to get to St Helena from Mount Veeder. A word of caution to friends whom have relatively low alcohol tolerance, for most parts this is a one-way road along steep slopes, drive slow or simply opt for the highway if you are in a tipsy state. PRESS Restaurant locates on the periphery of the town of St Helena, not far from Corison Winery which we visited on Day One. 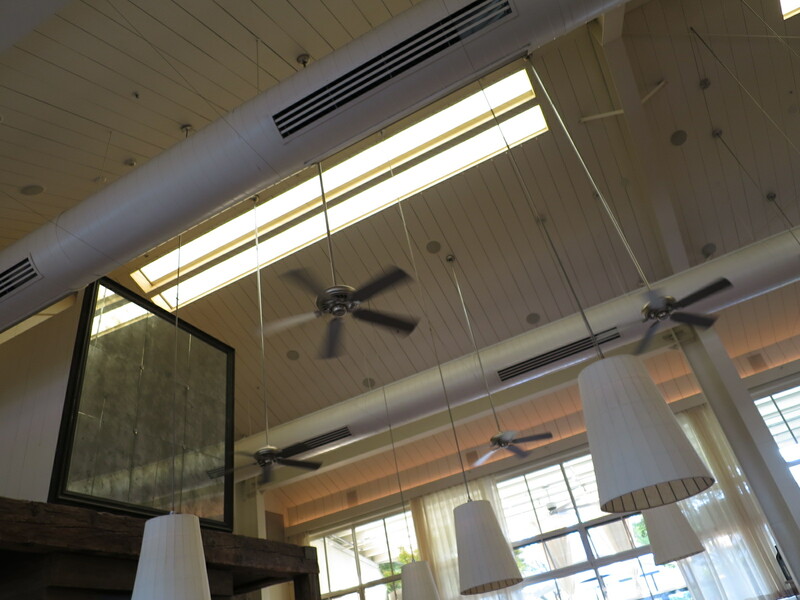 The modern farmhouse canvas sets a relaxed, laid-back atmosphere against which the pompous fireplace, ceiling fans and low-hanged lanterns accentuate the cosy restaurant space with a stylish touch of Californian luxury. 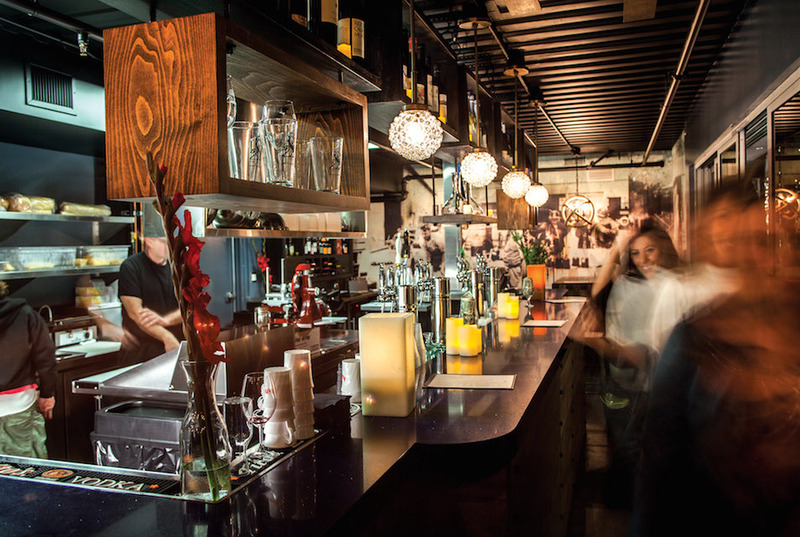 PRESS features an exclusively Napa wine list, and there are definitely great bargains lurking here and there if you look close enough! We got a bottle of 1987 La Jota Howell Mountain and paid US$135 for it. (After I got back to Las Vegas I wanted to get an extra bottle for myself and found that this wine is retailed at US$120 now!) Food is spectacular, and I had to give them extra credit for using BN Ranch meat. Hands down the grass-red BN ranch bavette was one of the best steaks I have ever had. In terms of food styling, PRESS might be a notch lower than Auberge du Soleil, but when it comes to quality of ingredients, I have to cast my vote for PRESS. 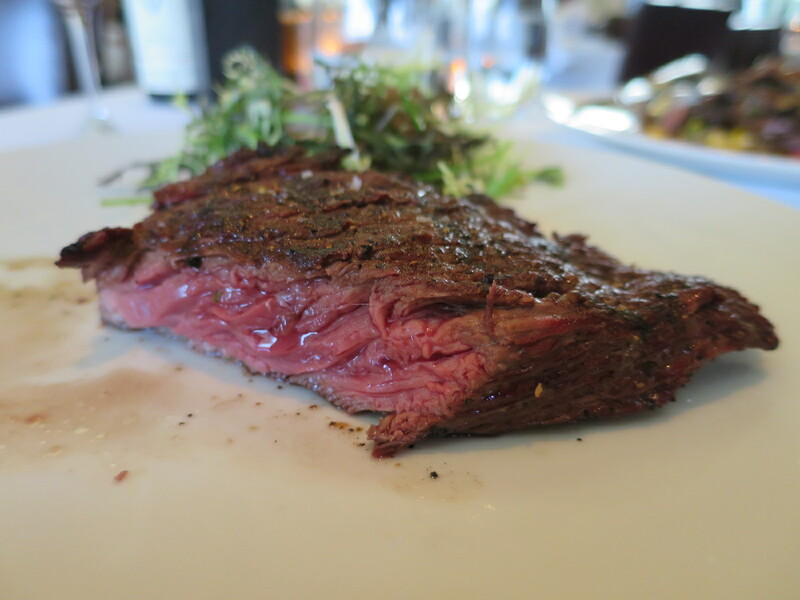 My favourite dish from PRESS, needless to say, is their BN ranch grass-fed bavette. After dinner I drove to Sonoma, feeling quite contented with our two days in Napa. In 48 hours time we managed to drive through and see almost all 16 Napa sub-appellations (to be exact, all except the two sparsely planted one i.e. Atlas Peak and Wild Horse Valley and the newest AVA Coombsville.) The following 48 hours, my heart belonged to Sonoma, a nice change of scene from Napa, everything is a lot more spread out, and diversity shines through a rainbow spectrum of grape varieties planted in this county. In twilight, I crossed over from the Cabernet kingdom to the Pinot Noir country, with Chopin’s posthumous Nocturne in C# minor softly playing on the background. Life is good.